Processing hyperspectral core imaging data is a challenge, with the requirement to simultaneously achieve speed and accuracy for massive data volumes. We started development on our processing software way back in 2001, so our experience counts in ensuring the best possible products. We initially adapted algorithms for airborne hyperspectral sensors to work with core imaging data, but as core imaging technology developed, so we started to develop processing specific strategies and algorithm. These have culminated in out IntelliCore system that controls data processing, ports seamlessly to our IntelliCore Viewer, exports products for integration into client databases, and links to third party software packages. And IntelliCore works rapidly and accurately to provide results that can be relied on. As standard products, we generate mineral maps, colour images, and a range of spectral parameters. All of our products are generated as image files in standard formats. All results are also supplied as downhole data files, at client specified intervals, that can be imported into any database. Products are automatically uploaded into Amazon Web Server for viewing in IntelliCore Viewer. 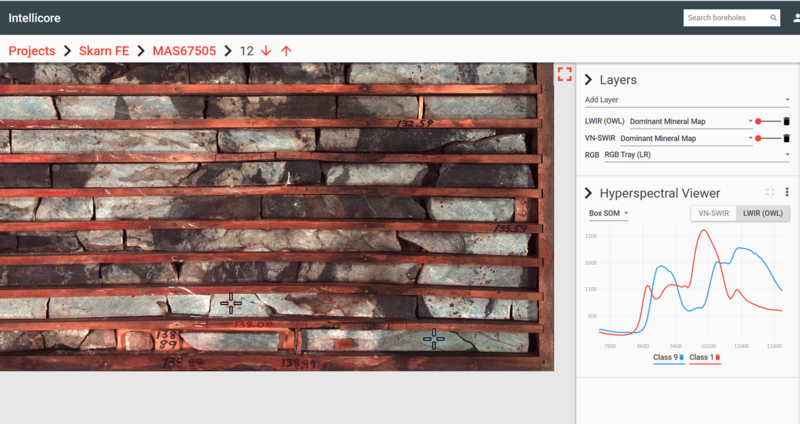 Automated mineral maps, colour images and spectral parameters are available within 24 hours of acquisition, and with IntelliCore Viewer able to operate off-line it means that products are available for use in the coreyard during logging. To achieve this, we process all data at the acquisition site using a powerful mobile processing unit. We provide the flexibility to generate mineral maps using both data driven and spectral matching approaches. Once key minerals have been identified, we develop mineral indices that provide information about spectral abundance and composition of those key species, providing important tools for applications ranging from exploration to production. And we firmly believe that the client is the owner of their data. We provide copies of raw and reflectance corrected data, and also store all data in our archive to ensure that information will never be lost.